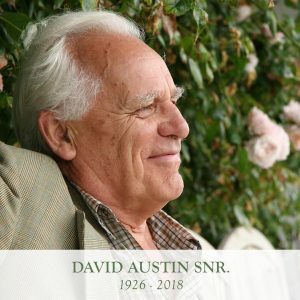 Even as a child growing up on a farm in England, David Austin had a fascination with breeding plants, but it was a gift from his sister for his twenty-first birthday that sparked what was to become his legacy. That gift was a book on roses. David soon began growing roses both old and modern. While he was impressed with the wide array of colors and the ability of hybrid teas to re-bloom, David felt they lacked the beauty, fragrance and charm of the Old Roses. 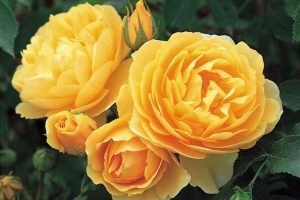 Short on experience, David made up with ambition, and decided to start breeding roses that would combine the best of the Old Roses with the positive attributes of the modern roses. The seed of what we today call English Roses had been planted. In 1961 at age 35 David Austin successfully created the first viable rose of the nearly 200 rose varieties bearing his name. He named it Constance. It would take another twenty years to begin to make a name as a rose breeder. In 1983 Mr. Austin took three of his roses to the annual Chelsea Flower Show. Among those roses was his now famous Graham Thomas Rose. His success that year began a tradition, with rose lovers eagerly anticipating his new introductions at this show each year. Now in its third generation, David Austin Roses continues to be a family business. His legacy grows with each new rose, and we are the beneficiaries of his legacy. David Austin senior passed in December at 92.